In my next lifetime I may just be a personal shopper! I love to shop; shop for myself, shop for others- I don’t discriminate! This may explain why putting together gift guides is one of my favourite blogging tasks! And instead of just including a bunch of online links for things, I like to feature real life items I actually use and love! I also like to highlight products from local businesses when possible too, because my love for local runs deep. In this gift guide, you’ll find something for any lucky lady on your list, at pretty much any price point! This beautiful Hathor Necklace by local jewellery Designer Alissa Ramage of Oneiro Designs is handmade, features natural crystals, and 24K gold trim and is only $38! Available in a variety of crystals/ colours (opalite, rose quartz, goldstone, green aventurine, blue sandstone, and tiger’s eye)- there really is one to suit everyone! I love that they all represent an element (air, earth, water, fire) which brings even more meaning and personalization to the gift. Find Oneiro jewellery at Hardpressed, Tryst, and The Brow Babe in Saskatoon or shop her online store! Bringing a gift for the host of Christmas dinner is an easy way to show your appreciation and also take the attention away from the fact that you didn’t contribute anything to the potluck ;) While a bottle of wine is always welcomed, a wood wick candle is a more unique alternative. This ‘Cozy Cottage’ Ebony & Ivory candle has notes of frozen pine, warm spice, brown sugar and a touch of vanilla- it smells of the holidays! Plus it’s phthalate free and 100% soy wax so you can feel good about burning it. Find it at local boutique All The Pretty Things by Kimberley J Gordon for $29.99. I think this next one was one of the best gifts I have ever got someone! My in-laws are especially hard to buy for because I really feel like they have everything and never ask for anything! So last year I made a mental note to write down anything they may have mentioned they wanted or needed throughout the year. One time my mother-in-law mentioned she wanted an updated family picture since their last one was about 20 years old. I purchased a gift card from Desiree Martin Photography for the price of a family session and I’m so glad I did! Now we have photos of our whole family, which we likely wouldn’t have got around to doing otherwise. A good gift idea for a newly engaged couple, expectant or new parents, or even your parents! A photo session is also a good gift ‘group’ gift idea to go in on together and have several people pitch in for. Gift certificates available in any denomination. A favourite among my fashion girls this season are Lack of Color hats. I recently treated myself to one and every time I wear it, I get a ton of compliments. And now I have a new one on my Christmas wish list! A must have for days when I don’t feel like doing my hair (ok, that’s everyday). If you have a lady who likes to stay on trend, this is a no brainer gift. These Australian designed hats can be purchased locally at Swank Shoe Lounge in Saskatoon and Regina. $95-$160. While we are on the topic of not wanting to style your hair, what better timesaver than a scrunchie! I recently picked up a pack of 3 locally made scrunchies from Erin at Foreverly Yours. and I think I’ve worn them everyday since! I love the neutral colours and fact that they don’t leave a kink in your hair. One lucky lady on my list is getting one of these in her stocking on Christmas morning (I can’t say who, in case she’s reading). And at only $7 each, you can gift a few lovelies a scrunchie this year! While I love participating in gift exchanges, I find these one of the most difficult gifts to buy! Most gift exchanges have about a $20 price point , so I have the perfect gift for your exchange! This simple and stunning necklace by local brand Ryan & Layla is a gift you can feel good about buying and giving, because 100% of the proceeds go to the City Hospital Foundation. It’s available in gold or silver and can be made longer or shorter. Available at Cravings, Capelli Salon, Just for You Day Spa, and Two Fifty Two Boutique in Saskatoon and if you’re not local, give Cravings a call to order one! If there’s an expectant mom or recent mom on your list, I’m your go-to-girl for gift ideas (I have some experience in this area). While showering the new baby is important, I feel strongly that we also need to acknowledge the new mom and pamper her too! She grew that baby after all! I often see new moms and everyone around them getting lost in the baby and forgetting what the mom needs- time for herself! And the easiest way for her to take some time for herself on a regular basis, is to have it scheduled into her week! Enter a gift card to We Move SK located in Market Mall in Saskatoon! This place has everything a mom-to-be or new mom needs when it comes to self-care; prenatal yoga, postnatal work out classes, classes for moms and babies, stretching class, support groups, you name it- they offer it! Purchase enrolment for any of their classes, OR a gift card and that mama will be so thankful you did! A new session is starting in January so the timing couldn’t be more perfect! $100 for 10 weeks. 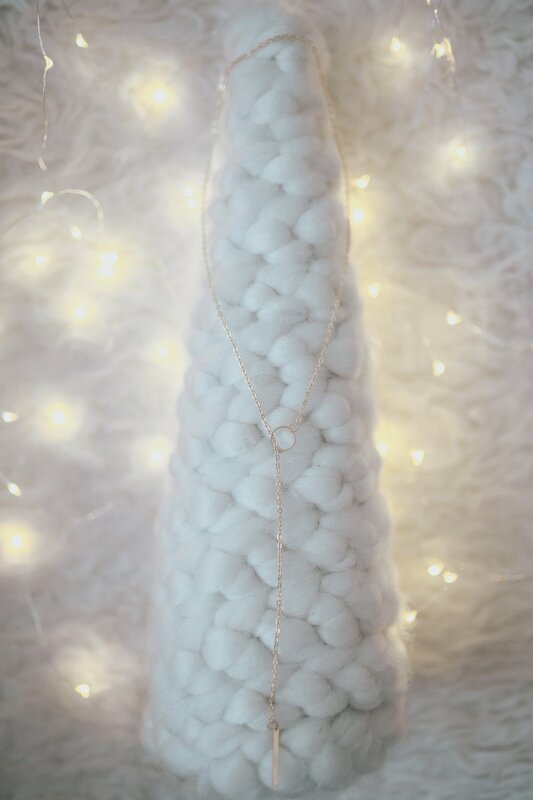 I love Oneiro Design accessories so much, I couldn’t feature just one item on my gift guide! I’ve never been big into bracelets (I’ve always been more for a necklace girl), that is until I laid my eyes on the Roster of Rogue bracelet in Rose Quartz. In fact, since I got it, I haven't stopped wearing it. It is so unique, I really haven’t seen another piece of jewellery quite like it. Friendship bracelets are still a thing, right? Your bestie would LOVE to wrap this little number around her wrist and it gives you an excuse to buy yourself a matching one too! Also available in moss agate this piece rings in just under $100. Last but not least, a little something for yourself! After all that shopping for everyone else, you deserve a little relaxation, girl! Something I just treated myself to was a Young Living Essential Oils Premium Starter Kit. I recently became interested in essential oils after using Thieves Household Cleaner in my home to try to combat all the germs this cold and flu season. I was so impressed with the cleaner that I started looking into other products by Young Living. After some research, I decided that the starter kit was the best value ($400 worth of product for $199.75!) and decided to order myself one. It has everything needed to get started with essential oils; a diffuser, a premium essential oils collection containing 11 oils including lavender, Thieves, and lemon, plus 8 other items! This would be a perfect gift for pretty much anyone on your list! If you are interested in ordering a starter kit or any other YL products, click the link above or feel free to contact me on instagram or email hello@kelsikendel.com. Happy Shopping ladies! Watch for my holiday gift guide for babies coming next week!